Beds are nicely made and uniforms hung with care in the sleeping quarters used by the North West Mounted Police at the Fort Walsh National Historic Site in Saskatchewan, Canada. 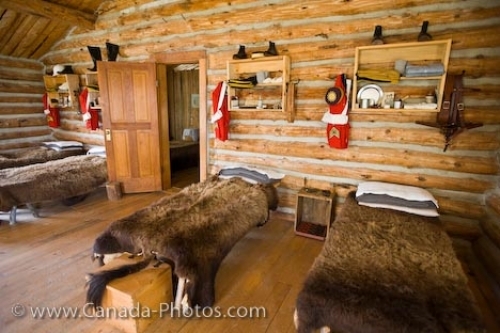 Inside a log building at the Fort Walsh National Historic Site in Saskatchewan, Canada, beds are nicely made with fur blankets in the sleeping quarters which were used by members of the North West Mounted Police. Four beds and shelves span across the width of the building all which have been refurbished to create a true picture of what life was like for the police members back in 1875. Above each sleeping location, a shelf decorates the wall where the men could keep their personal items and hang their uniforms each night. Up until 1883, when Fort Walsh became abandoned by the police as they moved to Regina, these sleeping quarters were places the men loved to be to rejuvenate and catch up on some well deserved sleeping hours. The sleeping quarters are just one of the buildings to view when visiting the Fort Walsh National Historic Site in Saskatchewan, Canada. There are other areas like the townsite, the cemetery, the trading posts, the massacre site and trails which lead along Battle Creek and Spring Creek. Picture of the sleeping quarters used by members of the North West Mounted Police at the Fort Walsh National Historic Site. Sleeping quarters at Fort Walsh National Historic Site, Cypress Hills Interprovincial Park, Saskatchewan, Canada.